This is a space for brainstorming about a microformat for resumes/CVs based upon the resume-examples that have been researched, documented, and analyzed, with an eye towards reusing portions of vocabulary from any well adopted resume-formats. 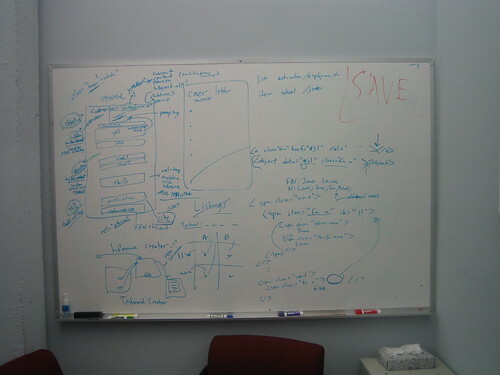 The following is the result of some brainstorming between some guys from Technorati and SimplyHired. Some people publish functional resumes, which are a somewhat inverted form of the traditional. See resume-formats for a description of common résumé elements. It seems that some of these constructs could easily be represented with existing microformats. The contact info block of a résumé could be expressed with an hcard. Educational experience could be expressed as a list of hcalendars. The rationale is that education can be viewed as a long-running event- it would be easy to reuse the vocabulary from hcalendar for describing events. Just like Education, work experience could be expressed as a list of hcalendars. Additionally, within a particular work experience, the list of job titles could be expressed as hcards. The only issue here is with having to repeat the FN for each of these hcards. It might also be useful to extend xfn for marking up links to employers and clients. Skills could be expressed as tags, using relTag. As with all rel-tag uses, a number of tagspaces would be appropriate. Any publications, presentations, or other works could be represented by a citation microformat. References could be expressed as a list of hcards, though web-based résumés tend to be light on using references. In our initial brainstorming, we talked about doing references in resumes. However, after doing the resume-examples research it doesn't seem that references are published on the web very often. LinkedIn allows users to endorse others' resumes. This functionality could be capture with vote-links. Like the previous, this doesn't get used on the open web much, so I (Ryan King) think it should be left out, at least initially. hCard for title, org, address of company, (optionally, work phone numbers, etc.). For "fn" use indirection by referencing "contact" hCard above with an object tag as explained below. hCard for the school with fn==org, address of school, (optionally, url, phone numbers, etc.). rel="reference" + XFN + hCard for references. rel="reference" makes sense because you are saying this person over here is a reference for the person represented by this resume. The lists of jobs, education, skills, references should all use XOXO. In typical resumes, each job listed also states the job title that the person had, as well as the name of the company, often the address (or at least city/state) of the company, and other information pertaining to the company. This is effectively an hCard for the person while they were (are) working at that job, thus it makes sense to markup all that information as an hCard. The only catch is, rarely do such hCards for each job include the person's name, visibly. Nor do we want to encourage people to replicate their name into those hCards (thus violating DRY) in invisible span elements. Thus the following code is proposed for a field (or several) in an hCard to reference another element in the document (likely the same field(s) in another hCard) and parse that other element as if it was inline in the hCard. This method of hCard property indirection via an object element could be generalized to apply to any/all string/text properties in hCard. Note: the object data attribute MUST be a local ID reference. External references (which would require a consuming application to load an external resource) are currently not supported by this method. Issue: need to check with Brian Suda to see how easy/hard it would be to add this to X2V. Given that it wasn't too difficult to add the table td "headers" attribute content indirection support, this should be just as easy. Status: According to Brian Suda: "... it shouldn't be too difficult... you are right it is pretty similar to the AXIS HEADER ID problems." Next Steps: Brian will try implementing it in X2V and we'll see how well it works. If it works, then we'll add it to hCard, hcard-parsing, and hReview 0.3 (as well as hResume of course). Note that the hListing proposal also has a similar requirement/concept and is currently using a notion of property inheritance from the context that it may be placed in (typically the page context). This may be an even nicer fallback from an authoring point of view, but may require more implicit parsing than can be relied upon. Implemented:Brian Suda: i have managed to roll this into X2V pretty easy, it is only in the beta X2V code, if it proves useful and worth while then we can roll it into the production version. Issue: These object elements end up rendering quite horribly in Safari, and display: none doesn't help. The solution is to style the objects with width: 0; height: 0;. Here's an outline of a strawman proposal. Simple, an hcard for the person in an <address>. A list of hCalendar events, one for each education experience. We can either define a mapping of the terms, or just let loose and let conventions develop naturally. A list of hCalendar events (one for each work experience). Optionally use hCards for describing job titles, organizational units, etc. We'll likely have a bit of a problem with not wanting to repeat FN for each hCard. Most resumes analyzed in the resume-examples page had a section for skills and/or qualifications. I think this usage can be best covered by using rel-tag, and not require a specific section for these tags. Perhaps add a 'skill' classname. Defer this problem to the citation work. contact info. required. <address> + hCard. education. optional. One or more hcalendar events with the class name 'education', with an embedded hCard indicating the job title, name of company, address of company etc. experience. optional One or more hcalendar events with the class name 'experience', with an embedded hCard indicating the name of school, address of school etc. references. optional. One or more references. summary:: This optional field serves as a overview of qualifications and objectives. contact:: Current contact info. The <address> with hCard. skills:: An hResume may be tagged using the rel-tag microformat and the 'skill' class name. rel="reference". For references, link to the person with rel="reference" and any other XFN values that apply (e.g. "colleague", "co-worker", "friend", "kin" etc. ), and use hCard to markup the name of the reference. To express multiple job titles/positions in the same experience event you should use hCards. hcard requires the fn ("formatted name") field, but it isn't reasonable to repeat your name for every job title you mark up in hResume. So, you may use an <object> with a reference to the fn somewhere else on the page. This method of hCard property indirection via an object element could be generalized to apply to any/all string/text properties in hCard. Note: the object data attribute MUST be a local ID reference. External references (which would require a consuming application to load an external resource) are currently not supported by this method. In 1999 I graduated with honours from a 4 year Hons BSc in Artificial Intelligence and Computer Science at the University of Edinburgh, Scotland. This degree is designed to give the student a firm grounding in the subjects of Artificial Intelligence and Computer Science while demonstrating how the two are related and how each can be used to supplement the other. Currently the education element of hResume is based on hCalendar which is great at dealing with the time elements of education item such as start date, end date and duration. It has also been expanded with an embedded hCard to help indicate the institution name, address etc. number: Used to define a group of qualifications. +1 TobyInk : the current hCard+hCalendar event model kinda works for experiences (though if they're intermingled it can be a bit messy), but is insufficient for education. The model above is much simpler to parse and also much easier to author. I'd suggest making "qualification" a "zero or more" property though — some courses are attended simply for education, with no bit of paper at the end. I'd also suggest that "experience" should be similarly rethought.